HC DrugFree is proud to partner with IMPAQ International's researchers, data and analytics experts, survey professionals, technical innovators, subject matter experts, and communications specialists. Today, HC DrugFree's Executive Director, Joan Webb Scornaienchi spoke to employees at their Columbia, MD location. Pictured left to right: Bryan Gale, Lauren Weinmann, Joan Webb Scornaienchi and Peter Morrison. HC DrugFree's executive director and past chair of the Howard County Commission for Women (CFW), Joan Webb Scornaienchi was invited to participate as a Substance Use Disorder subject expert at the Maryland CFW's Voices of MD Women round table conference held at Notre Dame of MD University. A report released by MD CFW, showed women across MD listed "women and drug use/addiction" as one of their top 5 issues. Pictured: Joan and her former Leadership MD classmate and current board member of the MD CFW, Brenda McChriston from Howard County. On behalf of Howard County parents and youth, HC DrugFree continues to remind merchants not to sell alcohol to anyone under 21 years of age. In June, HC DrugFree's team once again visited several liquor stores in Howard County and provided merchants with additional "Be A Parent...Not A Friend" educational campaign materials. Thank you to the many merchants partnering with us throughout the years and displaying our campaign materials. Please look for HC DrugFree educational materials at your local liquor store and thank merchants working with us to keep our youth and community safe. Tonight was the final Howard County Alcohol and Drug Abuse Advisory Board (ADAAB) meeting. HC DrugFree's Executive Director, Joan Webb Scornaienchi served as chair of ADAAB for 8 years and worked beside committed board members and members of the community. County Executive Allan Kittleman provided Certificates of Recognition for the appointed board members and the Howard County Health Department staff presented Joan with the beautiful glass sculpture to recognize her 8 consecutive years as chair. In the next few months, the County will form a new board to combine the efforts of ADAAB and the former Mental Health Authority board. HC DrugFree thanks Becky Mangus (right in photo), outgoing president of the Rotary Club of Columbia, for the club's generous donation. HC DrugFree's Executive Director, Joan Webb Scornaienchi accepted the check at the June 19 meeting held at Eggspectation in Columbia. Congratulations to the Rotary Club of Columbia for 50 years of Giving to The Community and the World. HC DrugFree's Executive Director spent the morning talking with Howard County residents at the new Elkridge 50+ Center. Residents learned about talking with their doctors about their medications, safe medication storage, proper disposal of medication, and so much more. Each participant was given a medication storage box. Members of HC DrugFree's Teen Advisory Council (TAC) volunteered at the Korean Fair to answer questions about the organization's services and recruit more teens from across the county to TAC. The fair was held at the Charles E. Miller Library in Ellicott City. Pictured: TAC member Calvin Lee, Joan Webb Scornaienchi and TAC member Tim Goulet. TAC is open to all Howard County high school students. HC DrugFree was among the organizations invited to participate in Bethany Lane Baptist Church's Living Free program. Participants were encouraged to live free from the chains holding them back. 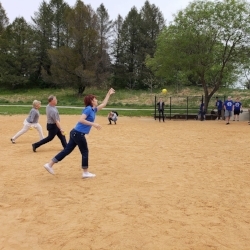 Howard County Executive Allan Kittleman, Health Officer Maura Rossman and HC DrugFree's Executive Director joined together to throw out the first pitch at today's first annual Recovery Oriented Services of Care (ROSC) Home Run for Recovery Softball Tournament held at Centennial Park in Ellicott City. Today, HC DrugFree's team of volunteers were busy from 10 a.m. until 2 p.m. in the Wilde Lake Village Center parking lot collecting 952.5 lbs of unwanted and expired prescription and over-the-counter medication as well as 18 bins of sharps (needles, syringes, and EpiPens). Maryland's Lt. Governor Boyd Rutherford presented HC DrugFree with a Governor's Citation. Dr. Calvin Ball (2nd from left) presented HC DrugFree's Executive Director Joan Webb Scornaienchi with a County Council Resolution. Event t-shirt sponsor Dr. Brian Morrison (far left) and Lt. Governor Boyd Rutherford. Thank you to the Howard County Police Department and the Drug Enforcement Administration for guarding the medications. Thank you to all our partners, volunteers, funders/sponsors, and the Howard County community.